What happened backstage at Wireless? We've got all the answers, plus pictures of Diplo's sad banana. 1. 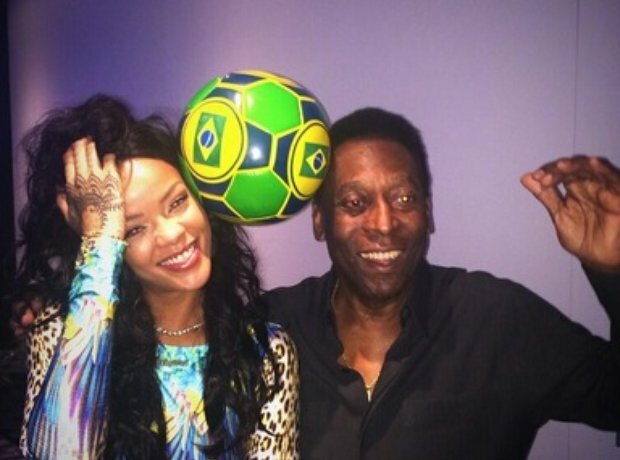 When Rihanna went to the World Cup and met Pele. 3. After meeting the football great, Rihanna and her friends partied hard. 6. That moment Will Smith joined Calvin Harris and Rudimental at T In The Park. 7. Drake and Chris Brown reunite in the studio together. 8. Eminem takes to the stage as he becomes the first rapper to headline Wembley Stadium. 9. Eminem was joined by Dr Dre in London. 10. When Nicki Minaj totally worked her new natural look. 12. When Chris Brown had a party up in the studio. 13. OK, Martin Garrix has a private plane with his name on it. 14. When Big Sean just casually threw a pool party. 15. Nas, Steve Aoki And Lil' Jon partied hard in Ibiza. 16. When Ciara debuted some amazing new dreadlocks following the birth of her child Future. 17. Seriously Ciara, you look amazing. 18. And if that wasn't enough, Ciara also shared this picture of baby Future. 19. When Drake posted this picture of his dad in the club. 20. When Kid Ink hooked up with Nas. 21. When Pusha T was chilling with Lewis Hamilton just hours before his British Grand Prix win. 23. And his tour DJ and Capital XTRA's very own DJ Charlesy snapped a selfie with Rita Ora. 24. Fuse ODG was hanging out with Sean Paul backstage at Wireless. 26. Chris Brown is officially back in the studio. 28. Meanwhile, Chris was wearing this amazing outfit. 29. Jhene Aiko was busy in the hot tub. 30. After being too sick for Wireless, Drake shared a picture of himself with his parents. 31. Tinie Tempah went to great lengths to make sure he saw Lewis Hamilton win the British Grand Prix. 32. And then he randomly bumped into Lily Allen. 33. Usher got his game face on for a water fight. 34. And so did Alesso for this photoshoot. 35. Meanwhile, Martin Garrix played the biggest gig of his life to 60,000 people. 36. Atumpan passed through the Capital XTRA studios to see Abrantee. 37. Back at Wireless, Kid Ink struck a serious pose. 38. Diplo was feeling sad, so he expressed his emotions through a banana. 39. But Usher chose a more conventional medium.